Conditioning has been integral parts of training for combat sports ever since there have been combat sports. As soon as the first combat athlete gassed – probably within the first minute or two of the fight no doubt – it quickly became obvious that any sort of hand to hand combat is incredibly physically grueling and not easy to do for long. Because of this, combat athletes and coaches alike have long been searching for the most effective ways to get in better shape and ready to fight from bell to bell. For countless years, one of the most relied upon methods used by wrestlers, boxers and other combat athletes to accomplish this was challenging task was good old fashioned roadwork. Everyone from Mohammad Ali to Aleksandr Karelin to Nick Diaz has been seen hitting the pavement and putting in their miles when getting ready for a fight. In recent years, however, despite the obvious success of those who have used it in the past, a growing trend in mixed martial arts circles has been to condemn any form of longer, slower paced training as outdated, overrated and unnecessary. The typical argument used to support such statements is that combat sports are not long and slow events and so training to get in shape for them should not be long or slow either – this is the basic principles of specificity, coaches often say. Many have even gone so far as to claim that anything other than high intensity intervals are a waste of time and can potentially lead to detrimental decreases in speed and performance. Although there is little doubt that all combat sports do require explosive strength and power, of course, there is much more to the roadwork story than such perspectives are often inclined to admit. While proclaiming roadwork and aerobic training are unnecessary might make for catchy headlines and sound bites, in this article I’m going to tell you why longer, slower, steady-state cardio training will soon be making a comeback and I’m even going to give you a new twist on this age old training method that will make it more effective than ever. Given the longstanding success and world class conditioning of some of combat sports greatest athletes throughout history that have been known to incorporate roadwork into their training, it may seem a bit surprising that it has come under attack in recent years as being an ineffective way to get in shape to fight. Along these lines, coaches arguing against the use of roadwork have frequently cited several reasons as to why they believe this type of training should be abandoned by combat athletes in favor of higher intensity training methods. Research on Roadwork Really Say? There is no doubt that there is recent research that shows high intensity interval training can be a more effective conditioning method than longer, slower, steady-state training such as roadwork. Almost all of these studies have focused on using VO2 max, the most commonly referenced measurement of aerobic fitness in scientific literature, as the measuring stick of changes in aerobic fitness and conditioning. Virtually all of the frequently cited studies have been no more than 6-8 weeks in length. These two facts alone underscore the need for context when it comes to interpretation of research. First, when measuring only a few weeks at a time, it can be very easy to misinterpret the findings and extrapolate the conclusions beyond their limitations. A closer examination of the studies comparing intervals to steady state conditioning methods reveals that those in the higher intensity groups do, in fact, tend make more rapid improvements in VO2 max. The problem, however, is that they also plateau much faster as well when compared to those in the lower intensity training groups. The infamous Tabata research, for example, one of the most commonly cited pieces of literature used to disparage the use of roadwork, showed that the improvements in VO2 max of those in the interval training group plateaued after just 3 weeks. Those in the steady-state group, on the other hand, continued to make improvements throughout the study period. Second, although research is often limited to measuring a single variable of aerobic fitness and conditioning like VO2 max for the sake of measurement and standardization, the real world of conditioning is far more complex than that. There is no single measurement or variable that will always directly correlate with an athlete’s aerobic fitness or conditioning level, there are many different pieces to the puzzle. Looking at VO2 max, or any other single variable alone, does not provide an accurate reflection of a combat athlete’s conditioning level. The bottom line is that looking through the research can help provide clues and valuable pieces of information, but the evidence must be carefully examined within the context of practical experience and the inherent limitations of only measuring changes in a small number of variables over a relatively short period of time. Training and performance are complex, multifactorial, year round processes and this must always be taken into account when trying to use research to validate, or invalidate, the use of various training methods like roadwork. Another of the arguments often used to support the exclusive use of interval methods instead of steady-state training is that combat sports are explosive and therefore anaerobic in nature. The biggest problem with this argument is simply that it’s not true. On the contrary, combat sorts require high levels of both aerobic and anaerobic fitness, but the overall majority, i.e. greater than 50% of the energy necessary to fight, comes from the aerobic energy system. How do we know this is the case? Well, for one thing, performance in sports that really are highly anaerobic, sports like like weightlifting, Olympic lifting, 100m sprinting, field events, etc. cannot be repeated without very long rest periods. Try asking a sprinter to run 100m at full speed and then run another one 20 seconds later and see what happens – I guarantee he or she will look at you like you’re crazy! In combat sports, the skills are certainly explosive, but they’re also highly repetitive and sub- maximal. You aren’t throwing every single punch or kick as hard as you possibly could. You aren’t putting every ounce of strength and power into every single movement because everyone knows that if you did that, you’d quickly gas out. The bottom line is that all combat sports require a balance of both aerobic and anaerobic energy development. Writing off methods like roadwork that have been proven for years to effectively increase aerobic fitness simply because they may appear slower than the skills of the sport is like saying there is no reason to do anything but spar because that’s the closet speed to an actual fight. A lot of proponents for the “nothing but intervals” approach also argue that even if roadwork is effective, it simply takes too much time and you can get the same results with less time using higher intensity training. The truth is that roadwork does take more time than doing an interval workout, there is no doubt, but this also is part of why it’s able to deliver more long-term results. As discussed previously, higher intensity methods often lead to greater progress in the short run, but this comes at the expense of plateaus and stagnation. Lower intensity methods may not work as fast, but they produce much more long-term consistent increases in aerobic fitness and when it comes right down to it, improving conditioning and performance requires time and hard work. As much as it might sound good to say you can achieve better results in 4 minutes than you can in 40 minutes, the real world has proven this idea to be nothing more than wishful thinking. 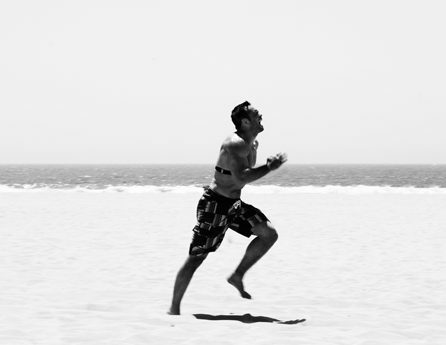 Just as a combat athlete shouldn’t expect to learn the skills and techniques of the sport in a short amount of time, conditioning and physical preparation should also be viewed as a long-term process that requires time and consistency. Those looking for the shortcut or the easiest route are often left lacking development and gassed out before those who are willing to put in the time it takes to get better. Given the amount of misinformation that’s been used to support the idea that roadwork should be abandoned as a form of training, it’s no surprise that the current interval crazy has failed to produce the results so often promised by those advocating it. Despite the endless promotion of interval training as the only form of training necessary, the world of combat sports has not seen a noticeable increase in conditioning over this time. If anything, in fact, the general conditioning level of fighters today is worse than it’s been in the past. Rarely does a major MMA event go by that we aren’t seeing at least one or more fights won or lost due to conditioning. This is happening at all levels and even in world championship fights no less! If intervals really are the answer and roadwork and lower intensity methods of training are unnecessary, then where are the results? Why do we still see so many fighters gassing out even though the use of interval training is at an all-time high? My prediction is that in the coming months and years, the combat sports community at large will begin to realize that although training with high intensity all the time might sound like a good idea in theory, it just doesn’t pan out in the real world. As a result, there will be a renewed interest in good old fashioned roadwork and we’ll start to see more combat athletes hitting the street once again in the name of conditioning. When used properly, roadwork is an effective way to increase aerobic fitness and improve conditioning without putting the high level of stress on the body that’s inherent to higher intensity interval methods. Training for combat sports is already brutally demanding and trying to sprint at top speeds and use explosive conditioning methods all the time on top of hours of physically grueling skill work is not the best recipe for long-term success. Likewise, hitting the pavement for hours on end isn’t always the best approach either and running large volumes and long distances can also take its toll on the body as well. There’s also times where running may not be the most practical option given different climates and times of year. In order to solve these problems and make roadwork type training more effective than ever, I started using a new method of this age old approach with all the fighters I’ve trained several years and the results have been highly impressive. I’ve used this form of training with everyone from Rich Franklin to Tim Boetsch and they’ve all reported consistent improvements in conditioning and fitness using the principles laid out below. Using these types of activities can provide the same level of benefit as running, while putting less stress and wear and tear on the joints. There is no reason that all roadwork needs to actually be done on the road, there are endless other forms of steady state training that are equally effective, more practical and less monotonous than running. Because of this, I prefer to use a mixture of steady state running and Roadwork circuits as described below. Aside from expanding the type of exercises used overall, I’ve also increased the variety within a given steady state training session and often use a form of circuit training. Although most people associate circuits with performing an exercise for only a few seconds to a minute at most, I have my athletes perform each exercise in a roadwork circuit for 5-10 minutes at a time. Not only does this break up the monotony of training, it increases the number of different muscles that will get worked within a given training session. When combat specific exercises like shadowboxing are included, it has an added benefit of increasing the specificity of the training as well. There are just a few key guidelines that need to be followed in order to make roadwork 2.0 as effective as possible. As long as you pay attention to these simple details, there is literally an endless combination of possible exercises and roadwork 2.0 training programs that can be put together to improve conditioning. Lower intensity exercise like Roadwork 2.0 helps promote blood flow and recovery, stimulates an increase in mitochondria (the cellular energy workhorses), builds work capacity and helps replenish levels of an important neurotransmitter called dopamine that gets depleted during high intensity training. Countless athletes that I’ve had start performing this type of training have reported feeling and performing better in as little as a few weeks. Give Roadwork 2.0 a try and see for yourself what combat athletes across all generations have known since the beginning of the sport, roadwork flat out works. 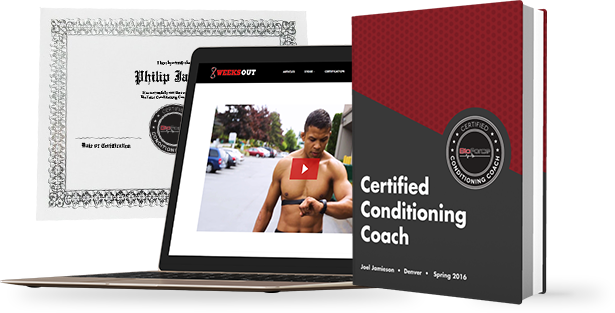 Within 8 weeks, it’s possible to dramatically improve aerobic fitness and conditioning with consistent training and an effectively managed program. One of the most important components of training is being able to see where you’re at and measure your progress as you go along. The following three assessments will help guide you in your training and provide a simple measuring stick you can use to compare your results to the pros. As with any training program, it’s important to keep track of your progress and monitor your results throughout. You can track your resting heart rate on a daily and weekly basis to look for trends and improved aerobic fitness and if you have BioForce HRV you can use it to help manage your loading to make sure you’re pushing to within your limits and not headed towards overtraining. This article has been reprinted with permission from Fighting Fit Magazine. I agree Joel, I am an elite level rower and have completed an iron man. Rowing is a race fro 6 minutes and requires a mixture if anaerobic and aerobic fitness. Elite level towers will often spend 60-90 minutes paddling to build their endurance base. They don’t just train 6 minute intervals. When I started BJJ nearly 10 months ago, Ive been able to outlast many more skilful opponents because of my cardio. Joel, great article, what kind of bodyweight calisthenics are you using in a typical 2.0 circuit, I can’t think of many suitable for 5-15mins of solid work keeping HR values in a 130-150 range? i.e I’m assuming the target is constant movement rather than a burpee/push up/walking lunge etc every 10 seconds and even then for most I would guess (certainly for me anyway) that muscular endurance would be a bigger problem over this duration. Clearly I may just need to man up though..
SOB… As I was reading I’m like “WTF, has he lost his mind? Did he watch Rocky I last night?” Then you brought things back to reality. Great article. Very sensible and practical for every fighter to use right now. I appreciate how you included the specific HR ranges along with the charts for the athletes to see. Verrrrryy Niiiice! Pingback: Anybody here do yoga along with their strength training? re: “Despite the endless promotion of interval training as the only form of training necessary, the world of combat sports has not seen a noticeable increase in conditioning over this time. If anything, in fact, the general conditioning level of fighters today is worse than it’s been in the past. MMA in general is so driven by such huge weight-cuts it is hard to get a grasp on just why fighters are regularly gassing out. I can’t help but feel that the UFC has inadvertently really tarnished it’s product by producing a sport where cutting weight is almost as important as anything else. We end up getting fighters in the ring who just aren’t fighting at their physical peak. Is this because of the interval training craze, probably. But add in the weight cuts and we have a perfect storm of lower performance. Can you incorporate some very lightweight kettle bell swings for 5-10 minutes as one of the exercises during the circuit?